Social collaboration and communications platform. "Best CRM solution for a medium size corporation "
"It ties all of the interactions in one place"
" Bitrix 24 a positive mechanism of acquired our company"
Bitrix 24, has been consolidated as one of the best software that our company has acquired, it has strengthened the projection of our projects, the workflow has done it effectively, progressively, organizes our work group feasibly, by means of its calendar sees the way to guide on each process in a precise and precise way, it can also be done through it a communication between client and company, it is very good for our processes as a company. We have seen that its interface is very simple, they need to improve it and put better themes, they must expand their characteristics, their acquisition costs should lower them more to make them more accessible to users. This software is new, simple in its functions but successful at the moment of operating them. This can be an option to organize your project schemes within your company or company. We can not deny that Bitrix 24 has been a positive mechanism acquired by our company, it has been very helpful to organize our labor flows, the projects are more organized, easy to handle, the data is at hand, we can interact with customers to through communications via chat or calls.
" organization of work instantly with bitrix 24"
It is fascinating to have bitrix 24 at hand, it allows us to easily perform our workflows in an effective way, it organizes our projects very timely, it is very good to guide by means of its calendar, it is exceptional optimizing our sales, it automates our managements of our projects to execute, is an easy tool and allows us to save time and money. As everything has weaknesses should complement the conversations within the platform, improve the graphic interface of this tool, the product has competitive prices, should look for the way to lower the prices of their licenses, when it is opened by means of Android mobile teams its operation is slow. This tool has been very useful, and it is good to recommend that it has helped us and has been very helpful, it allows us to improve our work day by day. It has been an effective alternative to organize our projects by means of their calendars and thus locate where and when a work commitment is going to be executed, its easy handling is a primary factor and thus allows to have quickly any information already entered. "Bitrix24 makes everything simpler thanks to its automation processes"
One of the things we like most about this platform is that it allows us to manage in an efficient and simple way the automation of the tasks of the company, resulting in a more effective control, being of great help especially for large projects. It also helps save time in managing the workflow of employees. We dislike that you do not have options for surveys and comments in the area of ​​digital workplace software. You can not manage newsletters something very negative for Bitrix24. We can not track milestones being this another thing that we dislike. It does not allow evaluation of potential customers a major flaw for this software. It falls short in terms of the function of committee management. It is fully recommended for both large companies and all SMEs. Our team could have a better continuity of knowledge by moving data from network sites and local units to a well-protected centralized repository. This platform is a highly secure solution designed to collaborate with its users. We have solved the problem of having a correct database of customers which we can use at any time we need it. Your system for campaign management is also useful. With its use we get good results in terms of the flow of automation of the sales force, increasing them by a good amount. You can run drip campaigns. "Bitrix24 is perfect for handling important documents"
Bitrix we like a lot, especially for its great ability to manage databases, and the ease it offers the user when it comes to handling discussion boards. We really like its price, of only $ 39 per month, and its perfect orientation to the Webmail application. We also like your CRM tool, because it allows us to take full control of our potential customers. What we most dislike about Bitrix24 is its slowness to make time reports, and its integrated calendar, which does not allow scheduling events properly. The website allows you to change customizable themes, but these are often confused with the letters on the page because they are white, and that makes it quite confusing to work with it sometimes. Bitrix24 is totally recommended for all kinds of small businesses. It is very easy to create an account on the page and start working almost immediately. We also recommend it for its task management system, with which it is very easy to organize. Bitrix24 is excellent. It has helped us a lot to keep track of clients, and allows us to be in constant communication with them. Your chat and calls system saves us the effort of looking for external services, since it offers a high quality. In addition, it is quite good for the direct handling of customer surveys and comments. "THE BEST SOLUTION FOR MIDDLE-SIZE COMPANY | CRM "
2. Product has various features for faster communication and a great cmmunication chat that can be used on the mobile. 3. Recently company updated the product and now it has even more features and is way way faster! The product is still being developed and is looking for areas to expand. Like with many products like that - all in one solution - the problems lie in the big variety of tools it used and that need to be maintained. That comes at the cost of poor design at some places and weird work from time to time. Nevertheless, the company tries its best and never stops, which I appreciate and enjoy. In my company, we solved several issue with bitrix24, which are - communication and task tracking. Before that we were strugling to work with several platforms such as google hangouts and asana, tried several task management tools like todoist and microsoft tasks, but nothing was full satisfactory for us. When we tried bitrix24 it showed us that we can have all solutions under one roof and focus on what maters - work. I would like to state that our departments became more organized and productive with the platform and now we use bitrix24 for almost all processes inside the company.
" an excellent job organization software for companies"
"Bitrix24 a good task manager to optimize our company"
We like this software because we were able to organize and manage our business operations and improve the work flow within this company, allowing the business to grow in an effective way, allowing us to make a positive technological change that is very easy to use and, most importantly, , can access in a timely manner optimizing the processes to be performed.
" optimal software for business processes"
we dislike the behavior of the user interface is very poor should do some updating, should improve the option of conversations within the bitrix24, improve the self-hosting that is usually very expensive, we suggest you add more features, the Technical support and customer service should optimize it more. It's CRM - Customer Relationship Management Software. The CRM in Bitrix24 provides a platform to organise and track interaction with potential or existing clients, partners, agents and other contacts. Bitrix24 CRM is also accessible on mobile with its mobile app. So you can find the information needed whilst on the move. Bitrix24 Mobile App CRM allows creation or editing of CRM entries and invoices directly from a mobile device. You can use the product catalogue, browse client records, and even make calls from mobile. Some app integrations that are hard to add on Bitrix24. I cannot configure some apps like mailchimp. So I am not sure if this is on them or Bitrix24. Anyways, as long as the CRM works good. I'd like the app integration to be easier to use. You can also add more apps that can be used on this platform. Invoicing, timekeeping, company pulse or rating, forms, contact for clients, chat groups and calls. Improve task management. Sometimes the tasks with subtasks are hidden. -The searching tool is great. It helps a lot to find registered information previously organized by company or contact. -The streamline feature is a great way to post information and communicate to all users or just to a part of them. It may include the segmentation based on groups (example: sales information only to salespeople). -Easy integration with other systems to automate marketing campaigns (example: MailChimp). -Easy setup on cloud version: register and start to use the software! The free version is good enough if your business is not so big or complex. -Sometimes the user interface is too complex in a few parts of the system. It would be great to have the chance to simplify some of them (self-configuration). -The permissions feature is limited. We tried to set up a specific user type (to restrict the access to CRM information) based on his own companies/contacts (something basic to a CRM) but it was not possible. -The features to manage deals and sales funnel are a bit complex too when compared to other cloud CRM providers. We tried to use this feature for a while but it did not fit to our needs. If you are searching for the best CRM (Customer Relationship Management) solution. Than, I would suggest you to have a look for Bitrix24 as this is one of the best place to provide one with the best ever experience for themselves. Also, it is best known to be one of the best thing that you can ever use. Here are some of the things that makes it a good CRM Solution for oneself. In some companies, decisions are made slowly and not very transparently. Bitrix24 solves this problem as you can use its enterprise social network and real-time communication tools (group chat and video conferencing plus Activity Stream intranet center) to get all the stakeholders in one place and make a decision quickly. -One platform for many solutions - CRM, project management, time management Project and TASK management tool really good. -A lot of features. Free to use. Versatile and flexible A lot of integrations. -Powerful and all in one project management and CRM solution. -The platform provides robust modules for intranet services like conversations, photo gallery, wiki, files, calendars, and tasks. -The cost is a major hindrance for most small organizations. The company could also improve on their customer support. -All features are bundled together. There's no way to get CRM or project management separately. -A bit complicated to get used to as user and admin. Bitrix24 makes communications simple with social features such as comments and liking, and automated processes like notifications, assisted reporting, and subscriptions to groups or discussions. Moreover, it offers practical solutions to manage a company online. Sales department uses the CRM solution, developers use specific PM tools, marketing department often has to use both. Then, there is a third solution for instant messaging, a fourth solution for intranet or HR needs, and a fifth – for the whole company’s knowledge base. "Bitrix24 is one of the best tools for partner communication"
Thanks bitrix24 we can communicate more effectively with our clients, fulfill work tasks faster, optimizes the time and effort, adapts perfectly to our team and the needs of these. "Workflow & Project Management Made Easy"
The complexity to which this platform is built out is insane, allowing managers to delegate tasks and include everyone on every project status at any given time of day. Chat, timecard, tagging of clients, data storage, you name it, project timeline automation, templates, email marketing - Bitrix seems to have it all and do it well. Sometimes the platform has slow days or technical glitches and tiny loopholes in the user experience that have been missed. We are lucky to have a Bitrix guru in our office to help solve for some of these instances. It will be hard to find an all-in-one solution that is this robust! This platform was very daunting at first but once its technical features are understood, it is unbelievable for managing task tracking and delegation. This allows us to talk easily with all members of our teams AND clients in one place in an easy, secure thread. Non-Bitrix users can still be a part of the workflow with email address inclusion. "To improve our workflow Bitrix24 is practical and safe"
As all software has its shortcomings, the lack of more functions and features, its costly acquisition, customer service is difficult to get them, its interface needs more details, sometimes it gets slow to load. We recommend it because it is practical and helps the company to effectively organize our projects easily and safely. It is gratifying to have this software that has advanced us on the projections that the company possesses, its mechanism has given us the opportunity to improve our work flow, it is practical and easy to use. It has very good and simple characteristics. "Bitrix24 is perfect for importing documents from excel"
We like that the alert system can be used to notify the members of a working group about corrections or modifications to be made in our work project. It is also very useful to organize tasks and have more effective control over them. We also like that you can send and receive notifications in a quick way. A great inconvenience that we have had with this platform is that you can not perform remote access to documents. It does not serve to keep track of approval processes. You can not do document indexing because it does not have this function. It does not have a search marketing engine. The tracking of visitors to the website is completely ruled out with this software. We are pleased to recommend this platform especially to those who need to save time in the execution of tasks since this software automates all these. It is ideal to keep in contact all team members and make a better collaboration between them. It also helps us with business management. We have had great benefits with its email tracking functions, it lets us do campaign management, team management and even send notifications automatically based on specific events. We can perform audience segmentation to have more control over this. Your options to customize campaigns are very striking and functional. Bitrix24 software can be used by any industry and offers so many features. It allows me to increase the efficiency of the business.it made my work a lot easier as it comes with a built in CRM and with all the bells and whistles of a PAID software suite for small businesses. other useful things such as the email server, the work groups, invoicing - it's everything I need in a very neat package. It has excellently unified communication system. A good and secure tool for effective communication, collaboration, lead and client management. helps me to communicate with my co workers and in getting feedback from them . Various features like scheduling meetings ,creating tasks . recording employee's profile ,Calendar ,adding contacts ,sharing ideas with in are its key factors . Everything seems to be fine but what i dislike is that If this software adds accounting and financials to the packages,it would be a one-stop solution for every entrepreneur. 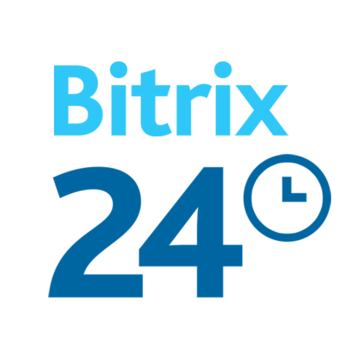 Bitrix24 is sometimes slow,,There should be more features available on the desktop version as well. More themes could be added to make the display page attractive . I strongly recommend Bitrix24 to each and everyone who is in need of a communication software which makes our work very easy and reduces out effort and time .Bitrix24 is a one-stop solution for every entrepreneur. It has helped me to maintain profiles and schedule meetings ,creating tasks and to get feedback form everyone which had help us to generate the revenue of the organization and develop its growth . Various features like scheduling meetings ,creating tasks ,recording employee's profile,Calendar ,adding contacts ,sharing ideas with in are its key factors which helps me to generate the revenue of the organization and develop its growth . "Effective management of teams and projects"
It has a quite simplified CRM system, which allows a great personalization and also a facility for the management of equipment and schedules along with unified communications, which facilitates the interaction between the different components. The tasks, the programming and also the project management are another of the elements that allow to improve teamwork, fluency and the effectiveness of the work. They also have an automation design and a very visual representation of the work done, which allows you to orient yourself much better in reference to the actions you are carrying out in a group. It's easier when everything is much more visual. The design could be improved, I think the interface in such a program influences a lot and the menus for me are somewhat confusing, I think it could be better structured to make it a much more powerful tool in terms of design, since in terms of options and configuration It is an incredible tool. It is a good platform that facilitates teamwork, interaction and working with the resources you really need, saving time and effort. It is a good decision if you prefer a good performance to a very attractive design. Bitrix24 has a large number of modules that can be activated or deactivated depending on the needs we have. The same goes for other functions, which can be chosen if they want to be used in a specific project or not. This has helped us to better manage and use resources, since we use what we really need in each project. The learning of the internal operation of the program is quite simple, it explains well the large number of configuration options and options available to manage projects. It is also remarkable accessibility not only through the web, but mobile applications, it is easy to work also from different platforms and thus be able to manage elements from anywhere. "Bitrix24 is a great business assistant"
Bitrix 24 is an excellent business management application that allows the integration of a large number of tools that seek to facilitate and improve the virtual interaction of users, as well as the use of multi-users at the same time through an interactive and friendly interface, easy and simple to manage, which allows developing the multiple tools of integrated social networks, such as facebook, twitter and Instagram Workflow, Gantt, process design, simple integration processes with third-party software, use of the user's preferred language. All this facilitates the search of content, internal communication services, financial management tools, calculation of fees and taxes, automatic payment tools. The automation of tasks and processes is one of the characteristics that I like the most and helps the ease of work performance. I like your video call system, the calendar. This application is compatible with Ios, Android, among other applications. What I do not like about this application is its slow registration process, its multi-user platform is only 12 users, its support system is regular. Your mobile application does not work as well as the Web application. The paid version is expensive, while the free version does not contain all the tools that the premium version has. I recommend organizations download and use Bitrix24, which will allow the development and improvement of the activities and tasks of the company and organization, as well as the automation of them. With Bitrix24 we have managed to improve the administrative and business management of the company, as well as the service of internal communications and video calls that allow improving the interaction between departments. This application works without problems, which has allowed us to improve and decrease the technical support is administrative procedures, as well as the automation of tasks has allowed to reduce the level of activities and manual tasks to be developed, as well as improve the efficiency and quality of the results . This allows us to disregard the development of programs, applications and tools for the development of each of these tasks that Bitrix24 already provides us. Bitrix24 is a social business platform for small entrepreneurs in its free version and for large entrepreneurs in its premium version. It has incorporated a large number of tools within its operating system according to the area of ​​interest. At the communication level it keeps the community more united through sequences of activities, group chats between departments and other business networks, calendars, work groups, among others. It allows you to import Instagram files and videoconferences of up to 10 users. At the level of activities and tasks Bitrix24 includes within its tools Gantt, Kanban, time tracking, workload planning, external users and more. It allows to develop support in real time through the most popular communication channels. Social networks, messaging and live chats, including calls and email. Among what I do not like about Bitrix24 is its price for the premium system, avoiding that a greater number of users have that system available, and that it does not integrate with more social networks besides Instagram. I would recommend the use of this application, even its free version will help your company a lot. Through Bitrix24 my work experience has totally changed. Now all the processes and activities are developed with an incredible efficiency thanks to all the tools that this application has, such as the Gantt and the customer support interaction. At the financial level, all my management and the performance of the department have improved enormously, while internal costs have decreased. Customers are more satisfied with our services, and we are more comforted by our performance. ""Creative platform for websites, communication, task management and projects."" In favor I must highlight this software product is that it offers templates ready to use in pages and businesses. A page can be created in a few minutes and without having to know how to code or program computers. In the design task we do not have to deal with how the web page should be adjusted in the different dimensions of screens, since this system takes care of that important aspect nowadays, given the variety of devices that are used today. . I liked your practical task automation service, which allows you to send and receive automatic notifications and track tasks to the assigned deadline. It has an excellent warning system that notifies you when the scheduled task time expires. It also offers a convenient and timely integration with Google Analytics so we can know the behavior of visitor traffic to our website. The website on the desktop computer is perfectly displayed, but when the window size is changed it tends to distort the appearance, the adjustment work is done but with difficulties in the result. If you really want to exploit the full potential of the tool, I believe that the learning curve is slow and that the documentation offered by the site is poor. It is difficult to have conversations in online chat while doing other things, apparently capturing many requirements. In addition, the chat screen is very large and modal type, which monopolizes the attention on the website. The telephone service seems expensive to me. I am not pleased with the spell checker, it raises many questions, since it indicates for example that a word is incorrect but does not offer a way to correct it. It is a wonderful tool to keep an organized business. It is very practical to maintain communication between work teams and clients. It is a competitive and innovative tool. This tool itself is very well made, well supported and flexible. Much effort is saved in the process of creating and managing websites and the CRM is simply very robust. In my case I explore it sufficiently in the aspect related to the planning of tasks and I must admit that it offers options that facilitate this arduous task, work that It is universally required in organized and competitive environments. "Best solution for Teams and Project Management"
I have used it for tasks management and email campaigns. I found it very simple and powerful tool for both purposes. Especially integration with other systems (like MailChimp) to automate marketing campaigns is very easy. What I found is that some interfaces are very complex of Bitrix24. Like you see too many options on a single window and you have to recall or explore the tools again. It would be grate if they could simplify it or give a self configuration at start so that user could setup the interface as per his own requirements. I would definitely recommend Bitrix24 for those who want all in one solution for their company from managing internal projects to interacting with clients. This product has lots of powerful tools which can be utilised to automate project/tasks/client management. I used it for Projects and Tasks Management. I configured my development team in it and all the created projects and tasks in the projects. and then assigned those tasks to concerned team member. That helped me a lot to gain the control on the project and to achieve timelines. "Best CRM for every company, free & paid, flexible things on a flexible platform"
The best thing is that they provide everything unlimited in their free plan as well and they give little good things on their premium version. The whole team uses this as their day-to-day use as CRM. We only dislike the dashboard, it looks bit awkward as from the interface we expect very cool UX/UI. Good product. Recommendation to companies looking for a one-stop solution. Using bitrix24, we handle our customer relations and do the management of the same. We have got a benefit by using this as we got everything on the same dashboard with all the cool stuff already present on the Bitrix24. "1 year of troubles "
Huge opportunities for customization, customization, integration with other services. Easy search for solutions to setup questions. The ability to write letters directly from the system with the help of a binding of working mail. The presence of an application for android. This helps to get access anywhere. One and the same need can be solved in various ways. This causes confusion in the sophistication of the work. The presence of unnecessary tools in the work complicates navigation and the user's work in the system. Additional functions require certain resources, but they are not used. The Bitrix 24 system is designed, first of all, for large business. This is a large multi-purpose portal, self-contained. When buying Bitmix CRM, you choose not a CRM system, but a huge portal with a huge number of features, which includes CRM-system among others. "Good Entry Level or Small Business CRM Substitute"
Project Management. It has proven a very useful project management tool that I was able to share with team members across the company. The Chat, Workgroups and Activity Stream facilities are really useful. Not sure how robust the system would be as a CRM for a large corporate organisation though. Data Inputting Form. The CRM Form creation tool is incredibly useful. I used it to create a way for my workers to forward the results of the data collation work they were doing for me. It works very well, and can be added to a webpage, or used as a standalone form. The UI isn't the most user-friendly when you first log in, but it's worth taking the time to have a good look around and learn about all of the tools included. It just takes a while to learn it all, as it's not particularly intuitive. Also, the reporting facilities and options are a little thin I think. Though it's a small thing, I'm not loving the constant stream of notifications that comes through when that option is selected, though I do keep it on as I need some kind of reminder system. Though it can be useful, sometimes it's annoying in the way that the MS PaperClip (remember that?) used to be annoying. Make sure that you set aside a couple of days to really explore all of the tools in the software. It's not easy to pick out all that it does as it's not really all that intuitive to use. But once you go and have a dig around, you'll find it's pretty powerful stuff. Keeping in touch with globally dispersed team members whilst working on a data collation and management project. "Great all in one CRM - it has everything you need!" Well, for starters, it's free and you can do plenty with it. Wish the email platform was more robust much like mailchimp or other email platforms. If you are looking for a communication platform to stay engaged and in touch with your clients, this will work very well. I'm able to better manage each client, from beginning to the end. Something I have not looked into is the ability to build a website, seems like an interesting feature and many can benefit from it. Landing pages, those are a must for lead capture. They also provide free domain and hosting. DO you want to keep track of tasks and projects, this will work well too! It has soo many features, take the time to get to know the platform and see what will work well for your and your business. "Best All in one Solution"
Bitrix 24 has an intranet solution for all an internal communication within the organisation. Bitrix 24 has a CRM solution for customer support and Live chat solution too. Email support and Phone system for free and pay as you go model for a phone. and Basic pricing is good and cheaper. Live chat is a bit longer and has over half of the website page should be smaller and crispy. Also Bitrix 24 sites beta should have a login form and domain to be integrated. "Very efficient and easy to use"
I use this program for my job and it is a great method of communication among my coworkers! Sometimes the app crashes and is a bit slow to open. The app is significantly easier to use than the website. The website can be a bit confusing when attempting to sign in. Apart from that, if one is looking for a program to help organize and increase communication among their coworkers please consider using this app. It fosters employee collaboration and communication and is very efficient and easy to manage. If a coworker is going to be late or is unable to come into work, Bitrix24 is a great way to find someone to cover their shift or to communicate with fellow coworkers. I really enjoy features like the integrated timeline and the option to share contents segregated by group. The search tool is also very useful and transform Bitrix24 in a real collaborative repository. CRM features are also interesting and useful to organize companies, contacts, history of activities, etc. Sometimes the CRM features to manage sales funnel and deals are a bit confusing. The software is not 100% in portuguese and frequently there are updates that brings new terms in english (not yet translated). There was one specific event that made us disappointed: a free funcionality (where we used to register information) became part of the paid plan and simply was hidden from us (we lost our data). Try it for free (do a pilot) before implementing. We use Birtrix 24 as a content repositoty to promote collaboration and performance support, register the history of relationship with our customers and leads, register companies / contacts data, manage individual calendars, among other activities. It became an important internal network to share/seek knowledge and useful information. "Excellent Features for an Affordable Price"
The free account set up allows you to test multiple functions. As you needs increase you have the ability to integrate more options at affordable prices. The interface and ease of use are outstanding and easy to master. Free training is available via web and if you like more personalized training Bitrix24 provides these feature as well. The number of features included at first could be overwhelming to integrate as a whole CRM solution. Customer service is mostly via email and you may have to wait a couple of days for a response. This is a company that reinvests in improving functionality and features. Like any other CRM software, the learning curve may be initially taxing. Download a trial version, start using it, get training and fully implement when ready. Project management, CRM and workgroup colaboration. "Worst Customer support I've ever witnessed "
My life before I started with Bitrix24. I remembered that i had fun and could focus on my own business. Now I am licking my wounds and are stuck in a vortex of zero help and losing lots of money. Zero customer support, zero soft skills. The management is either on a holiday or doesn't care too much about their company. Worst is when they haven't replied for hours until that moment you want to go to bed. This is in the 2 decades i am involved in customer support by far the worst company i've had to deal with. I have realized that Bitrix24 is not a professional company. If you want to use their free services go ahead. However as soon as you want to use their professional services, that is when the troubles start. I've spend literally days and nights with them on the chat (no phone number) for something that could have been solved in 10 minutes. You will always receive a reply, however most of them are automated replies. They say that they are real humans but the answers you receive are making me doubt i am talking to real people. When you file a complaint and ask to speak to a manager, he is either on a holiday or he's giving the same generic answers. !! !STAY AWAY FROM THIS COMPANY. I LOST LOTS OF CUSTOMERS AND MONEY BECAUSE OF THEIR LACK OF INTEREST IN THEIR CUSTOMERS. YOU HAVE BEEN WARNED!!!! "With bitrix everyone is on track"
What I like the most in Bitrix is the possibility manage your work in a timeline like Gantt Diagram. I want to see improvement in the way we communicate. Nowadays to monitor and manage your computer project, bitrix24 is the best tool to use, it is web-based and you can install it on your tablet and smartphones. My experience with Bitrix24 while working for Atalou Microsystem as IT Manager is something to keep in mind, we were always aware of any projects and task of everyone in the company. In a kick-off meeting, everything is explained and available to you, even if we don't have the full outline of a project. With Bitrix 24, you know when a project supposed to star and finish. You know what is happening? You follow all the improvements of every step and all the process within that project and to who a task is assigned? You can also report to your stakeholders of the project because all the information you need is there in Bitrix24. All of the change within the course of a project are notified to your email with the user or the person accountable for a specific task. Using bitrix24 is the best way to share everything with your colleague, you don't have to send email to remind a task to be done. We can use in real time while working out of office. Everyone is on board and tasks are assigned. "Flashy graphics for a reduced experience"
Bitrix has a great way of organizing the social side of online-only team projects. The visual arrangement is quite interesting and the side bars are for the most part functional and easy to learn. Managing and editing deals and contacts is made easy by one-click editing and saving. Multiple key commands make navigation easy on the wrists, freeing them up for other activities. Notifications are loud and vibrant, ensuring a prompt response to the more urgent tasks. Assigning tasks is done via a user-assignation system, which makes it easy to stay accountable and on task. Bitrix is riddled with whimsical graphics that smooth over the transitions from page to page. They ultimately slow down the experience and draw the eye away from the more critical business elements of the page. On top of that, helpful reminders reminiscent of 'clippy' show to block key functions of the page, making them hard to ignore and, at the end of the day, frustrating. Be aware of its limits before becoming fully invested. Bitrix helps me keep track of the multiple hundreds of calls and emails I send out cold every week, allowing me to keep the clients who are interested and warm up potential future clients. I can track personal interactions and ensure that every meeting is met with a perfect recollection of our entire interaction history. "Review of Bitrix24 for Team collaboration"
Bitrix24 has a very flexible pricing plan so it can grow as you expand, starting from a free version. It is a simple communications system and it can work in conjunction with Google docs for editing documents, even by people who don't have Microsoft office on their computer. To date my experience with this software has been very positive for communications and collaborative editing, I'm not convinced yet about the project management side of things such as setting task deadlines with automated reminders. However every time I take the trouble to look more closely at its menus I find more functions. You have to get used to different titles for somethings - such as "workgroups" which I use for what I called "projects" in other software. But I soon got used to that and in some ways it makes more sense to call them workgroups anyway because it is about managing the people who deliver the project. I work with an international team and this software allows us all to plan and deliver projects together. As a non-profit organisation it has enabled us to reduce overheads on basic communications so that we can use our resources more effectively. This software covers not just basic CRM but also lead management and email marketing integration and even some automation. My main concern with this software is that its massive array of functions can be overwhelming for first-time users. In the beginning, this software can be a bit overwhelming...Take the necessary time to learn it and this software will really become the last CRM that you will need! Try not to want to learn everything in one day...It will only confuse you! "It's the best Collaboration Platform!" I like how easy it is to use. I remembered using it for the first time and knowing almost instinctively how to do things I want to do using the platform. When I do get confused, their Support Training Course is accessible and easily understandable. And it's worth mentioning the quality of the video when you share your screen during a call. Better than any other tool I used! There's absolutely nothing I dislike about Bitrix. It's a great tool! I don't understand why it's not getting all the hype it deserves. Just give it a try and you won't regret it. It helped improve team collaboration, communication, files storage, and task management. I like how Bitrix 24 allows you to ask your co-workers for help. You can discuss plans and projects, and your co-workers can comment on what you post. I think it is a great program that allows everyone to get involved. Also, its a great way to allow help for those who have questions or would like feedback on what they are working on. I think Bitrix 24 allows communication in the office run smoothly and effectively. I think Bitrix 24 might be a little overwhelming at first. I think once the business learns how to operate Bitrix 24, it is effective. However, there is training involved which is time consuming. I would highly recommend this program! If you have the time to learn the program, then jump right in! Once you implement the program in your workplace, you will see your business running smoothly and effectively! I think Bitrix 24 is solving task related problems. You can now keep track of tasks and projects, and know what is going on in the workflow. I think when a business is effectively working together and accomplishing tasks, then the business is growing and achieving. Also, Bitrix 24 allows you to plan meetings, even on your mobile device! This solves problems such as, not knowing when or where a meeting is taking place. Communication is key in running a business and Bitrix 24 allows this to run properly! 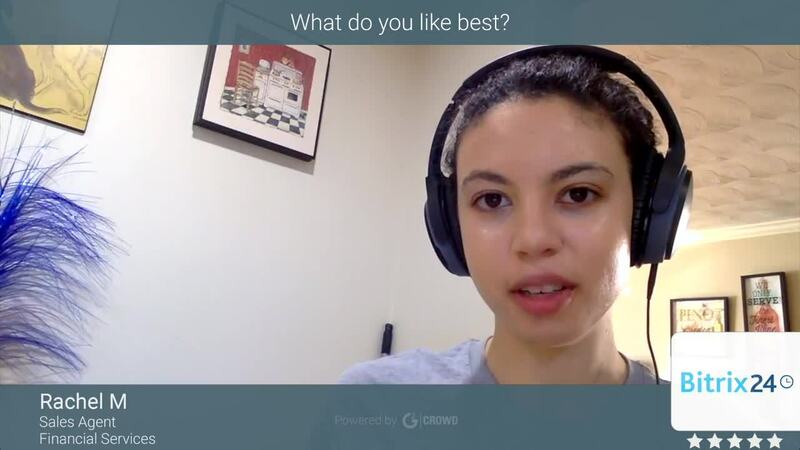 "Bitrix24 is a good CRM Solution"
I like the fact that Bitrix24 has everything to start working right away, from an internal social network with video chat, project management, desktop/mobile clients and document collaboration. For the basic tier you can start a team with 12 users with all the tools for project management for free. For a small businesses, that's likely enough to let your whole team start using it and collaborate in a project. Most paid CRMs with free or basic plans only let you bring a couple users along, but not Bitrix24. -Friendly integration with other services. -Unable to be used on Windows phone. -Only a few apps available in the marketplace and most of them do not add value to the app. -Support only available in English. -Intuitive UI and better UX. Be prepared to upgrade, because the free version is not enough if you have a larger team. Bitrix24 is a nice solution providing great usability and plenty of features. We use Bitrix24's as a project management and social network to work with our team across several countries. We tried it as an alternative to run our whole company from one place. File sharing and daily meetings were the main tools we used to work with our sprints (Scrum), using bitrix for our status meetings and project progress. On the CRM side, we found a full-featured CRM that let us manage our contacts, automatically email them or call them right from our dashboard, and even send out invoices. At $39 a month it is cheaper than the alternatives. I love the ability to easily implement qr codes for things. Bitrix24 is a free collaborative tool available for up to 12 users. Both iOS and Android apps are also free. In paid plans, you do not have to pay for a separate user but for additional disk space and some optional features. Time management tools include check-in/out feature, regular work reports, and daily planner. If you roll it out slowly your employees will love it. Improves employee engagement, allows you to communicate quickly, and eliminates the need for multiple programs. 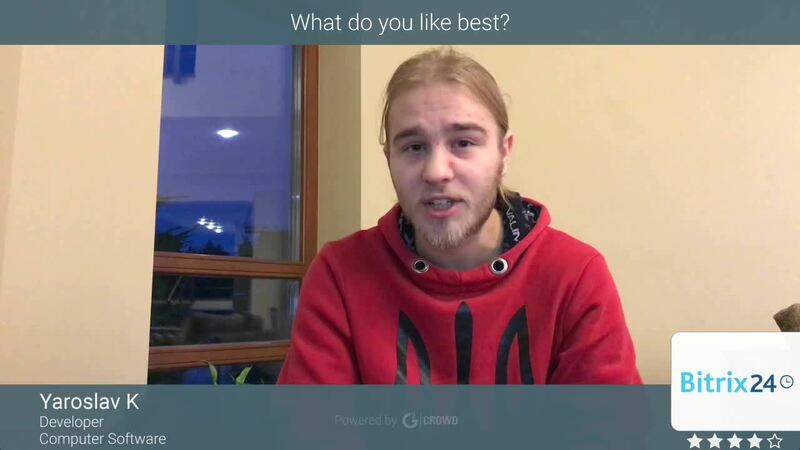 "in my opinion the best for free"
the app is not good, should be done simplier and easier to find everything. Also lack of integration with apps like IFTTT. it's worth trying. Hope they keep up the good work. I'm a project manager with a lot of different projects. So I'd like to have all the tasks and procedures in one app so that it will automaticly remind me for the next step. So far I'm still in the building process to make it all work fine. "Big bang for the buck, tough for support"
Compared to most other similar applications, this offers an extensive array of feature sets and abilities. The fact that this will integrate with VOIP services is wonderful, but getting the software to integrate will take considerable amount of time and cost. The customer support is lacking at best. The company is based in Russia, and your "chat sessions" will be mostly comprised of them referring you to a link, which won't answer your question. There have been times where the system proved unreliable or just lost tasks altogether, which is NOT an option that we are willing to accept on any level with any software. We were told we need to hire a software support company that will make these changes for us, but this is neither something that Birtrix does directly and normally is comprised of another company based out of the U.S., which adds to the language barrier. The little things are what are most annoying to us. You cannot have a task with a deadline of the last day of the month, only a specific day of the month - how tough could this be to perform? Making sure that our workflow processes don't fall through the cracks for our customers. We are able to quickly identify areas where job processes are bottle necking and help us create internal checks and balances to address those slow-downs in our business to better the experience with our customers. "Fully Loaded yet Cheaper Option"
Bitrix is fully loaded and a great choice. If you need it to do something, it probably can. Not much of a learning curve. Lots of features, but not much depth in them. Lacks good Drive (Google, Drop, etc) integration. It works to an extent, but doesn't allow folder uploads or anything of the sort. Hard to run everything off of it. Be sure to delve into all of the features before choosing. It may not be as deep as you would like. Bitrix was a much cheaper solution than the others for our business. It was either free or very low-cost for what we needed. It solved our communication and project management issues as well as cost. "Warning! They will delete your data for inactivity with barely any warning." It was a fairly good system until they deleted the entire account while I was out on extended leave. Support was OK, functionality was reasonable. The fact that over a year's worth of data was deleted by the company. They only notified the administrator & not the other 5 users on the account. Nothing is perfect, but deleting 18 months of data after 6 weeks of "inactivity" is absurd. People go away on sabbatical, maternity leave, have extended medical leave or bereavement. The emails they did say hid the warning messaging so far in the subject & email, that you wouldn't have been able to tell them from marketing emails from the company. Their customer support was RUDE, unapologetic, and defensive. Don't use it. Having data deleted after only 6 weeks of inactivity & with little warning is not something you want to experience in your business life. None. They unfortunately created more problems than they solved. "Great project planner tool. " This software is so much more than a project planner tool, I believe that it'd be a very good 'entry' level CRM. However, I just use the one functionality of Bitrix24, which is the project/task planner. I discovered it whilst trying to find free to use Gant Chart software and this perfectly fits the bill! It's a great platform for colleagues and teams to come together and collaborate on work. You get alot of notifications from this platform - I have had to turn mine off as they were becoming quite spammy. This depends on the reasons for using it? It seems to offer a full suite of products - suitable to manage a smallish database of contacts with regards to using it as a CRM - it is fairly easy to use and I doubt it would take long to get up and running. For our purposes, it works as a good project management/planning tool. Collaboration and management of multiple ongoing projects. Bitrix helps me to juggle a lot of projects at once and help keep me and my team on track with deadlines and ensures that interdependent tasks also do not get forgotten about. "Simple to use, and a good start for a small business"
Good reports and funnel diagrams etc, good for checking progress of deals both historic and ongoing. The blog section is good for team-building and general updates. Little opportunity for automation - in a way, functions more as an address book. Be disciplined and instruct yourself fully on how to use the product before implementing - technical support is not brilliant, and a lot of it is do-it-yourself. Keeping track of potential deals, prospects, and leads that otherwise would be lost. Bitrix does nearly everything. I love the desktop and mobile phone apps that allow me to chat and video conference with my distributed team. It keeps us in sync even though we're spread across the country. The interface still looks like something from early 2000, which make using the tool less enjoyable. I wish there were a configurable dashboard so each user could show what's most important to them when they log in. More linkage with other software and automated workflows would be really handy too. Try it! They have a very robust, free, cloud-hosted version that will give you a clear picture of how the tool will fit into your business. If you're working with a team that isn't co-located, Bitrix24 is tough to beat at any price, and pretty much impossible to top for free! Bitrix makes managing and tracking a distributed team much easier. It also make it easier to feel like a real team, because we can all talk to eachother whenever we're online. I really can't say enough great things about Bitrix24. Well, it's pretty tough on where to actually start, this product does essentially everything. But, in some cases that can be good and bad. Some CRM and loaded software packages can get a little overwhelming and I feel like Bitrix24 is on the cusp of that happening. There is just so much happening at any given time when you are using this software that it can be hard to manage sometimes. There are seemingly 2000 options on the left nav and being from the UX/UI world, that can be a little daunting at times. If you are going to use this product then make sure to give it a fair go. Don't just try it and then jump ship. Poke around and make sure this is or isn't a good fit for your company. I am solving the issues of team collaboration as well as communication. This platform allows you to do many thing, even make phone and video calls through it which is great. Like I mentioned before. It essentially allows you to do anything. "Big Bang... not just a theory"
Bitrix24 is a very comprehensive solution, offering virtually every feature that a small business thinks they need and many that they haven't yet imagined. There may be more bang than the buck really needs. A surplus of features on a dated user interface can lead to a confusing and frustrating experience. Be careful about biting off too much. The price point is phenomenal, but the system can really overwhelm you, making you feel like there is more you should be doing than may be appropriate to your business. Spend time really understanding your needs before diving into this software. We looked to Bitrix for a CRM solution. It met every need we could have imagined, except for the need for a manageable solution that didn't overwhelm the team. "Bitrix, Excelente produto para auxiliar na gestão de tarefas de sua equipe." Da organização das tarefas, é bem completo e de fácil gestão. A tarefa pode ser subdividida, pode ter checklist, pode ser acompanhada por um gráfico de gantt. Neste ponto o produto é um dos melhores que já testei e usei. Gostaria que o produto tivesse uma lista de tarefas de modelo, para ser aplicada em alguns processos. Sem tê-los que criar novamente a cada nova distribuição para um agente da equipe. Quantificar os processos em execução e acompanhar sua execução. Outra grande ajuda que o produto trouxe, foi uma maior retenção dos conhecimentos através da rede social, criada dentro do ambiente, onde podemos compartilhar artigos e realizar algumas reflexões sobre os mesmos e melhor os processos. * We monitor all Bitrix24 reviews to prevent fraudulent reviews and keep review quality high. We do not post reviews by company employees or direct competitors. Validated reviews require the user to submit a screenshot of the product containing their user ID, in order to verify a user is an actual user of the product. Hi there! Are you looking to implement a solution like Bitrix24?